The crown chakra (sahasrara) is infamously known to give us access to a higher state of consciousness or intelligence. Headstand (Sirsasana) is a unique pose in yoga, in that it is one of the few poses that directly stimulate the crown chakra, offering us access to a higher state of intelligence. Yoga makes a clear distinction between the mind (manas) and intelligence (buddhi). Our mind, as metaphorically pointed out by B.K.S. Iyengar, is like a computer and information storer. The mind is clever, but cannot function without memory, and is equipped with a simple instinctual tool – “repeat pleasure and avoid pain”. Unpleasant experiences are stored in the memory as “avoid pain”, which is used by the mind to evaluate an experience and consequently action on. Through this simple binary tool, the mind is governed by mechanisms that resist change. Intelligence (buddhi) in yoga, however, is the wisdom stored deep in our consciousness. It has the ability to stand independently outside the self and perceive objectively. As such, it differentiates truth (satya) from falsehood, and makes true wisdom possible. By stimulating the crown chakra in headstand, for a short moment through the practice of awareness, we are given the opportunity to glimpse into this wisdom. The headstand alignment, as described by Iyengar in ‘Light on Yoga’, it that the “lumbar and pelvic region should not be pushed forward, while the trunk from the shoulders to the pelvis should be kept perpendicular”. If you put this to practice, you would soon realize that to get to the perfect alignment, it first feels like you are going to topple over backwards. Our mind, from memory formed by cumulated experiences, would generally tell us not to align the trunk and pelvis in one line; because if it feels like we will fall backwards, then we would most likely fall and the experience would be painful and embarrassing. So the mind would simply decide to “avoid pain” and signal the brain to back off. A lot of times yogis, like myself, make the most common mistake in headstand, which is to bear the weight of the body in most secure part connected to the floor – our elbows through the strength of the biceps – because the mind through experience knows that the arm is more stable than the head, so the arm should bear the weight. When we do that, the trunk generally tilts forward, out of alignment with the shoulder and the pelvic, causing unnecessary pressure on the lower and middle back. Even though we would have been taught the right alignment, often time the mind takes control by disguising itself as wisdom in order to avoid what it assumes would be a painful experience. Yoga is a journey through consistent practice. And one of the greatest gifts of the asana practice is the awareness it creates – first with the body, but progressively to our mind, self and intelligence. By cultivating awareness through consistent practice, I started seeing the character of the mind for what it is – simply a collection of past memories. It does not always serve me in the present. And it definitely does not serve me in my headstands. My daily headstand practice encourages me to push past the decisions made by the mind, to accustom myself to the soft voice of intelligence in order to find the right balance. Beyond the physical asana, it has transformed itself into a deep internal practice of learning to tune in and trust the wisdom from within – to know and trust that I can transfer my weight further back towards the crown of my head. The asana practice, over time, dives into layers beyond just the body. We all have deep intelligence within us. But sometimes the loud voice of the mind deafens the whispers of true wisdom. The asana practice is like a hearing aid that makes the voice of intelligence audible. To quote B.K.S. Iyengar “It is through the alignment of the body that I discovered the alignment of my mind, self, and intelligence”. Looking at the classic preparatory headstand stance; both hands clasped, forearms grounded, top of head placed on the mat with hips lifted up and feet walking in, it is a rather intimidating sight. Truth be told, the preparation to manoeuvre into a headstand is a lot tougher and more tiring than the actual pose itself. This is probably one of the main factors as to why so many yoga practitioners simply aim to “jump” their way straight into the inversion. In this instance, I would suggest going slowly but steadily. because safety should be of utmost priority during practice, not mastering the poses on your first few tries. NOTE: NEVER neglect your pre-headstand warm-up. The time taken to get your shoulders, spine and neck stretched might very well be your first defence against injury. So here are some warm-up exercises to get those shoulders opened and to lengthen your neck and spine before attempting a headstand. A headstand is all about physics. Your body has to be in a straight line with your legs engaged, tailbone pointed downwards, spine lengthened and shoulders rolled back and away from your ears to prevent any compression at the cervical region. Engage your all four limbs, your glutes and core muscles while in this pose. Stay here for 10 breaths; feel and remember this body alignment. 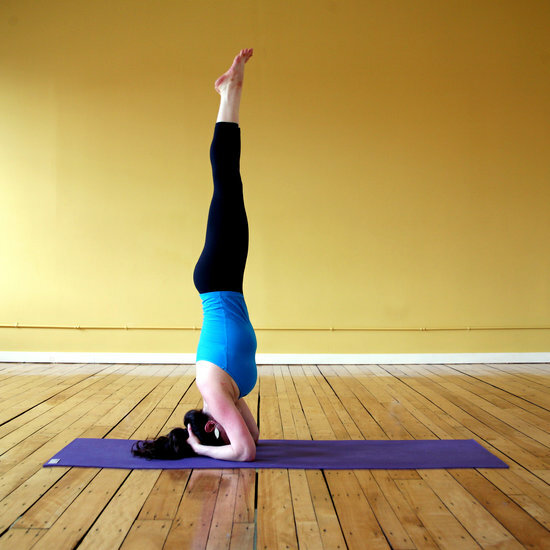 A headstand is basically an inverted Tadasana. Stand with both legs hips-distance apart then bend your left arm at the elbow to reach to your back. Right arm bends at the elbow and reaches above the right shoulder to reach the left hand (use strap if necessary). Hold here for 10 breaths for each side. This exercise not only helps to open up your shoulders, it also assists in depressing both scapulae in preparation for the headstand. Maintain hip-width distance between both feet. Place left arm beneath the right arm and twist it into eagle arms. Repeat with right arm under left arm and remain in this pose for 10 breaths per side. Legs remain engaged and spine is straight. Eagle arms help to release any knots in the shoulders and warms up the wrists. Extend both arms behind and interlace fingers. As you fold forward into Uttanasana, lift both arms up hight and reach as far over the crown of your head as possible (similar to Prasarita Padhottanasana C, but with legs hip width apart). Stay here for 10 slow counts; continue to keep spine lengthened and try not to bend the knees. After that, come up slowly, vertebrae by vertebrae. Come down to both knees, tuck your toes under your feet and clasp both hands in front of you. Place both arms on the mat with elbows approximately 1 forearm’s length apart. Shoulders remain away from your ears. Take a deep inhale and as you exhale, left your knees off the mat by lifting your hips up towards the ceiling and planting your heels into the mat. Engage both arms by pressing forearms against the mat. Shoulders remain depressed, neck and spine are lengthened. Take 10 slow breaths here. Once more, remember how your forearms, shoulders and neck feel whilst in this pose. This is how it will be like in Salamba Sirasana. The weight of your body is on your upper limbs; there is NO pressure on your neck whatsoever. Now you are all set to do your headstand! With both arms maintained at the same position during dolphin pose, place the crown of your head in between your palms and walk both legs forward until your hips are in line with your spine. Lift up your dominant leg with toes pointed to the ceiling; use this leg as the fulcrum to assist in lifting your other leg up. And there you have it, Salami Sirasana scored! Neck, shoulders, spine and hips have to be in a straight line. Lift your hips up, do not jump! The headstand was one of the more earlier poses I worked on when I first started practicing yoga. There’s something fun about inversions in general, but to fully conquer and to work on my headstand is one of my biggest goals. There are many physical and mental benefits to this pose, known as the king of asanas. It has anti aging elements, reduces stress, increases focus, and strengthens your arms, core, and shoulders. Even though it may seem unnatural at first, when you are upside down in a inversion the blood that is now being redirected from your toes to your head really refreshes your body. Some people even say that frequent headstands can bring color back into grey hair. There are also many different variations to the headstand, with supported headstand (salamba sirsaasana) being one that beginners usually practice. Dolphin plank is a good way to slowly get yourself used to having the weight on your forearms rather then on your head. This is hugely important as when you are up in headstand, the crown of your head should not feel the pressure of your body as it causes strain on your neck and can cause injuries. So while people may think that arm strength is the key to headstands, I would say that core has a lot to do with it as well. If you can strengthen your core and engage it while you come up, your body will be tight and balanced. If your core is loose, then your body becomes loose, and balance is difficult to maintain. Of course there are cautions, that being if you have high blood pressure, low blood pressure, back injuries, you’re currently menstruating and pregnant the pose is best to be avoided. After you come out of the pose its always important to lie in childs pose to let the blood flow return to normal. How does inversions like Sirsasana affect our body? For the first time in my life I did head stand, I loved it and I always long to do the head stand because it makes me feel refreshed and it gives med a sort of balance in both my body and mind. But how does the inversions really affect our body? People use normally around 10% of their alveolas capacity in a normal daily life. Through activity you can train your alveolas and use a larger amount of them and you train your heart activity. When you do the Sirsasana or any other asana inversion you reduce the heart rate but increase the stroke volume. This increases the capacity of your breath. The stroke volume is measured in litres per hour. When doing an inverted asana like the sirsasana, the volume of blood per minute is increased and the heart size increases and this makes the strokes bigger and stronger to be able to transport the blood throughout your body’s system. Inverted positions could be compared with an upright standing position, just to give a reference, where the blood pressure decreases which leads to that less blood and oxygen is transported to the brain. When you go upside down to do a head stand you take take shallow long breaths, keep steady, put weight on your elbows and the dristi, gaze, on your nose tip, tight core muscles and strong but relaxed legs. The inversions not only improves your heart, thanks to the anti gravity inverted asanas can have anti aging effect too. And it helps you balance and stay focused. The Sirsasana is a perfect asana to improve your oxygen uptake, improve your hearts capacity and to make you feel rejuvenated. I’ve been practicing yoga for a while and my headstand practice has been less than awesome. I know that I am strong enough that I should be able to rise into sirsasana with control and ease. Once I am up, I can hold it up to 50 breaths, depending the day. My problem is in that moment, just as you shift weight onto your forearms and head when your toes and knees are supposed to float up. Mine don’t float. I tense up, over-think the motion and usually just kick myself up. This is not ideal. After 3 weeks of yoga teacher training, I improved all my asanas, but the transition into headstand was still lacking. I was starting to reach the point where I thought I might never float. What if there was just something about my body, my practice that wouldn’t float? And then, the other morning, it happened. I was pretty much convinced that I’d never float. My mind has given up and in giving up I think I stopped worrying about each piece of the asana. I was too beaten up to stress about the moment when my feet are supposed to float and when I stopped thinking, they floated! So what did I learn in all this? If I really thought that I couldn’t reach sirsasana with control, I probably would have stopped trying. I didn’t because something deeper than my mind pushed me to keep going. When my mind finally gave up, it just stopped and my body was able to take over. And I floated. It seems like everyone has an opinion about Sirsasana. Either it is one of their favorite, most restorative and calming asanas or they struggle enormously with it. I fall into the first category. Ever since I was a child, I loved hanging upside down. I was always upside down in trees, on monkey bars, on couches. Since my mom practiced yoga, she taught my sister and me how to do headstands early on. Ever since, I’ve been hooked. I think one of the things I love about Sirsasana are the options: you can get into it in a variety of ways; you have options about your hands; you can play with muscles, alignment, and movements while you hold; you can come back to your feet as you please. Depending on my mood and what my body is asking for, I will hold my arms in tripod (and even there, you have options! ), keep my elbows snug around my ears, or push myself with my arms outstretched. If I’m feeling like wiggling my hips, I can flex my knees and use the weight of my feet to pull my hips forward and back. If I’m feeling like really engaging my core, I can open my legs in a splits position and rotate them, one leg front, one back, then switch. Or, if I’m looking for focus and stillness, I can practice balance, listening to my breath, and gazing ahead of me. Being inverted helps me find my balance, helps me take the weight off my feet and knees hips and spine. It helps my heart pump blood to my brain and thyroid and lungs. It helps my internal organs to get a little room in their cave. It calms my nervous system, washing my cells with parasympathetic hormones. When I come out, I feel like I’ve accomplished something. I held an asana that is challenging, I gave my heart some help, I flooded my brain with oxygen and nutrients. I feel strong, focused, and clear. Sirasana (sirsa = head) or Headstand is an inverted pose which reverses the action of gravity on the body. Inversions turn everything upside down, allowing us to experience a different perspective. The increased blood flow to the brain brings increased oxygen and nutrient to the mind thereby improving the clarity of thought and ease of concentration. – The increased blood flow to the brain stimulates the pituitary gland which revitalises the mind and central nervous system. The pituitary gland is considered a “master gland” which controls the function of the endocrine system including the thyroid, adrenal gland, ovaries and testes. These glands in turn regulate metabolism, growth, blood pressure, sexuality and other fundamental body functions. An imbalance of the secretion of the various hormones produced by the pituitary gland can lead to many serious disorders of the endocrine system. – The inverted pose ensures good venous return where the blood will return under gravity without the need for muscular activity. Below the level of the heart, pumps are used to bring blood back up to its level. These skeletal muscle pumps are found in the veins. Contraction of skeletal muscle squeezes blood through them and because they are one-way valves, blood only moves in one direction, towards the heart. Therefore it is necessary to have muscle activity whenever we are upright in order to ensure good venous return. By performing the headstand, the venous return increases and the additional blood stretches the walls of the ventricles. When that happens, the stretched muscle fibers in the ventricles automatically pump more strongly, thus increasing the cardiac output. It resembles the cardio-vascular activity achieved while exercising. – The pose helps to relieve anxiety and other psychological disorders. – The final position requires muscles in the neck, shoulders, arms, back and abdomen to be active, which strengthens and revitalises the entire body. It strengthens the core muscles and uppper body. – The inversion changes the effect of gravity on the body, which has an important effect on blood circulation to the legs and head. – The pose increases pressure on the diaphragm which aids deep exhalation to expel waste gases and bacteria from the lungs and can relieve the daily effects of gravity on the spine. – The inversion encourages an upward flow of energy, from the Muladhara Chakra (root chakra) to the Sahasrara Chakra (crown chakra). It helps to awaken the Sahasrara chakra (Crown chakra) which is deemed as the most important Chakra intimately connected to, and influencing, all other chakras and controlling consciousness. 2. Rest the crown of the head on the mat, so that the back of the head touches the palms. 3. Raise the knees, tuck the toes under, straigthen the knees and raise your hips (visualise a downward dog). Without bending the knees, walk the feet towards the head, gradually bringing the weight of the body onto the head. Pull your hips back so that your neck is not bent backward or forward, but is in a straight line with the spine. 4. When the feet are as close to the head as possible, lift them off the floor (one by one or both with control), bend the kness and slowly bring the thighs close to the chest. 5. Once stability is achieved in Step 4, slowly raise both knees using your abdominal muscles and point the knees toward the ceiling until the hips are facing forward, the thighs are vertical and the knees are aligned with the buttocks. 6. If comfortable, slowly straighten the legs so that the head, trunk, back of the thighs and the heels are in a straight line perpendicular to the floor. This is the final position. Relax the legs and feet. Keep the back active to support the spine and hold it straight. Relax the mind and breathe normally. Contraindications: High and low blood pressure; Glaucoma; Detached retina; Haemorrhaging or other brain disorders; Chronic or acute neck pain. 1. Sit in Vajrasana (kneeling position), by contracting the hamstrings and plantar flex the feet by contracting the gastrocnemius and soleus muscle; close your eyes and relax the whole body. After a few minutes, bend forward, by contracting the quadriceps femoris and the gluteus maximus and place the forearms on a folded blanket with the fingers interlocked and the elbows in front of the knees, by contracting the deltoid muscle to flex the arms, and contracting the biceps brachii muscle to flex the forearms. You should have an equilateral triangle from the distance between each elbow and the distance between the elbows to the interlocked fingers. Place the crown of the head on the blanket between the interlocked fingers. Wrap the hands around the head to make a firm support so that it cannot roll back when pressure is applied. Contract the levator scapulea to bend the head forward and protract the scapula by contracting the pectoralis major, rhomboideous and the latissimus dorsi. Lift the knees and buttocks off the floor, straighten the legs and start walking the feet forward on the tip of your toes. Contract the quadriceps femoris, the gluteus maximus, engage the core muscles, uddiyana bandha (draw the abdomen in and up) and mula bandha (engage the pelvic floor). Your chest is folded down against your thighs with the knees straight in a posterior stretch. Your hips are flexed. (You can bend the knees if you don’t have enough hip and hamstrings flexibility). Your back should be slightly rounded at this point and almost to the point of tipping over (protaction of the scapula by engaging the serratus anterior or boxer’s muscle). Then bend the knees slightly, press the thighs against the abdomen and lower chest, by contracting the hamstrings. 2. Once you feel most body weight is on the shoulders and the legs become weightless, gradually raise the lower legs in a controlled movement by contracting the hamstrings. At the same time, you should be retracting and depressing the scapulas by contacting the pectoralis minor, and transverse abdominis, external obliques and uddiyana and mula bandha. Adjust the trunk slightly to counter-balance the weight of the legs by contracting the core muscles. This is a difficult stage to remain in for a long time, because the weight of your legs has to be supported by your deep back muscles. Poor hip flexibility and short hamstring muscles is the main obstacle at this point, it will keep tension on the pelvis and the back rounded, and this prevents you from distributing the majority of your body weight above your head. The less flexible the hips, the more weight you will have to support on the forearms as you lift the feet. 3. Extend the hips, so that the thighs move up and away from the torso, by contracting the gluteus maximus, the hamstrings and keeping the core muscles engaged. Raise the knees until they point directly upward and the thighs are in line with the trunk. Balance the body. This position is very stable; you can stay in it as easily as in the headstand itself. Because your knees are flexed and your feet drop to the rear, it will require a more prominent lumbar lordosis to keep your balance. 4. Finally, slowly extend and straighten your knees by contracting the quadriceps femoris to raise the lower legs. As you do this, the lumbar region will flatten to compensate for the fact that the feet and legs are now in line with the torso and thighs. You will gradually shift your weight off the forearms and balance on your head. The whole body should be in one straight line with the feet relaxed, the core muscles stay engaged. Do not crush the neck; depress the scapulas to keep them stable by engaging the rhomboideus muscle. Gaze at your nose tip and breath slowly to relax in this position as long as it is comfortable (10 to 30 seconds for beginners and gradually adding more seconds, 3 to 5 minutes is sufficient for general health). You should put your awareness, when first practicing, on maintaining the balance; for adepts, on the brain, on the centre of the head or on the respiration. Or on the spiritual side, you should put your awareness on Sahasrara Chakra. Slowly bend the knees and lower the body with control, in the reverse order, until the toes touch the floor, by contracting your abdominals muscles. You can rest in Balasana (child’s pose) for a while then slowly return to the upright position the counterpose (Tadasana). Sirsasana should not be practiced by people with neck problems, headache or migraine, high blood pressure, heart diseases, thrombosis, arteriosclerosis, chronic catarrh, chronic constipation, kidney problems, impure blood, severe near sightedness, week blood vessels in the eyes, conjunctivitis, chronic glaucoma, inflammation of the ears or any form of blood haemorrhage in the head. It should not be practiced during pregnancy or menstruation. This asana is very powerful for awakening Sahasrara Chakra (situated at the crown of the head, corresponding to the pineal gland of the physical body) and therefore it is considered the greatest of all asanas. Sirsasana revitalizes the entire body and mind. It relieves anxiety and other disturbances which form the root cause of many disorders such as asthma, hay fever, diabetes and menopausal imbalance. It also helps to rectify many forms of nervous and glandular disorder, especially related to the reproductive system. This asana reverses the effect of gravity in the body. Strain on the back is thus alleviated and the reversed flow of blood in the legs and visceral regions aids tissue regeneration. The weight of the abdominal organs on the diaphragm encourages deep exhalation so that larger amount of carbon dioxide are removed from the lungs. The headstand lifts your spirits wonderfully. If something is drawing you dawn, turn upside down, and voila! The downward flow is upended into your head. The headstand is also a great morning wake-up. It increases digestive fire, counters depression, and fills you with enthusiasm for meeting your day. But doing this posture to excess is like increasing the voltage in an electrical circuit. Be careful.